How Does Hummus Benefit Your Health? Home » Food and Nutrition » Is Hummus Good for You? How Does it Benefit Your Health? Is Hummus Good for You? How Does it Benefit Your Health? Is hummus good for you? Hummus is a healthy, nutritious dip that has been eaten in the Middle East for centuries because it is so cheap and easy to make, and is packed with protein. Made from chickpeas (also called garbanzo beans) and tahini (ground up sesame seeds turned into an oily paste much like any other nut butter), hummus’ health benefits are plentiful and it’s a great option for quick lunches when paired with raw vegetables and pita bread. The Arabic word for chickpeas is literally hummus. Hummus is nutritious because both chickpeas and sesame seeds are high in protein. To make hummus you need a can of chickpeas, a jar of tahini (which you can get in most grocery stores in the specialty aisle) a lemon, olive oil, garlic, salt, and perhaps a little bit of water. First, drain the beans, and here’s where you can do two things depending on preference. You can simply drain the liquid from the can and rinse the beans in cold water and then place them into the jar of a blender, or you can add the beans to water in a pot and gently boil for a few minutes to properly cleanse the beans and heat them up so you have a warm dip. Whatever you decide, get the beans in the blender, add the oil, lemon juice (about half a lemon), garlic (to taste, but use at least one clove), salt (to taste), and about a quarter cup of water to start. Blend until smooth. If it isn’t smoothing out add more water, a little at a time, until it gets to the desired consistency. You can make a number of variations to this basic recipe by adding sun-dried tomatoes, basil, or roasted red peppers for added flavors and colors. A typical serving size is anywhere from half a cup to a cup, but really there are no limits with this because hummus is good for you. To be clear, homemade hummus is what we are talking about here, not commercially packaged versions that are more often than not loaded with extra fat and ingredients that might not make it a good quick snack. 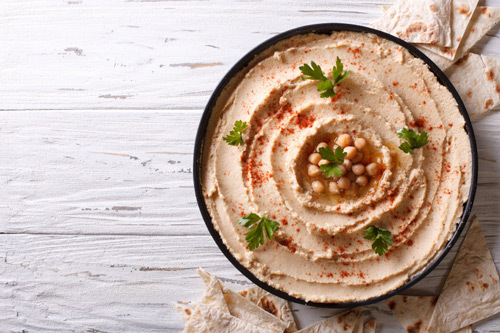 Some companies add mayonnaise and soybean oil to their hummus preparations, and both of those ingredients really cut into the health profile of hummus by adding unneeded fat, and what’s more, it’s fat that isn’t from a healthy source like olive oil. Soybean oil is cheaper, so companies tend to use it instead of a high-quality olive oil. Natural Ingredients: Hummus is healthy because when made at home it consists of ingredients that you know. Canned chickpeas can be high in sodium, so look for low sodium on the label. They aren’t that common, but the hunt is worth it. You can prepare the chickpeas yourself by purchasing dry beans and soaking them overnight, but be warned: this isn’t always successful and your beans won’t be as mushy as the canned variety, and it tacks on a lot more work to what is supposed to be an easy recipe. Nutritious Ingredients: One cup of hummus, the basic recipe version, has about 400 calories, and roughly half of that is from fats found in the sesame paste and olive oil, but these are good fats and nothing to worry about. In the same serving size, the beans offer over 50% of daily dietary requirements for fiber and 39% for protein. Can Help You Lose Weight: The key to losing weight is to increase protein in the diet, but to pair that with fat, so hummus is a perfect food to consume when on a diet because one serving provides over a third of your daily protein needs. A 2014 study published in the Journal of Nutrition and Food Sciences found that people who ate hummus regularly were 53% less likely to be obese and 51% less likely to have issues with high blood sugar. Despite hummus’ nutritional profile, there are a few things to be wary of when it comes to this food. Hummus is made from a legume and sesame seeds, so be cautious if you have an allergy to those foods; it’s probably best to avoid it altogether. Consume in reasonable amounts as it is high in fat, but hummus does have a lot of nutrition to offer, so don’t be afraid to enjoy it every day as part of a meal or as a snack between meals to keep you full. “Is Hummus Good for You?” Healthsomeness web site;http://www.healthsomeness.com/hummus-health-benefits, last accessed March 2, 2016. “Is Hummus Good for You?” Livestrong web site, November 2, 2013; http://www.livestrong.com/article/409280-is-hummus-good-for-you/, last accessed March 2, 2016. “Is Hummus Good for You? 6 Health Issues the Super Food Dip Can Treat,” Medical Daily web site, March 24, 2015; http://www.medicaldaily.com/hummus-good-you-6-health-issues-superfood-dip-can-treat-326708/, last accessed March 2, 2016. Tags: Hummus, Hummus Nutritional Profile, Is Hummus Good For You?